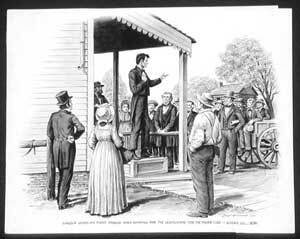 Description: Lincoln, making his first political speech the 3rd time he ran for the Illinois State Legislature in Athens, Illinois. The Colonel Matthew Rogers building was included in the ink and wash, and the grove of trees was in the foreground as the day-by-day stated. Lincoln gave his speech in a grove in Athens, Illinois. Researched by Dr. Wayne Temple. Art Sieving created diorama from this ink and wash.